“Three things I fear,” said the devil. Yet these three things are all part of Christianity. It’s as if the devil were saying that of all faiths (Buddhism, Islam, etc.) he fears ONLY Christianity, because Christians alone have the appropriate weapons to fight him. This means the following: Only by Christianity is the devil bound hand and foot. In the other religions he has a free range of action. “For all the gods of the heathens are devils, but the Lord made the heavens" (Ps. 95:5). And, “They sacrificed to demons, not to God" (Dt. 32:17). Another very important weapon against the devil is exorcism. At baptism, according to the Holy Fathers, the devil is at the center of the soul of the unbaptized. Through exorcism, he is expelled from the heart and the person is set free. “Depart from him/her, every evil and unclean spirit hidden and lurking in the heart.” So exorcism is a dreadful experience for the devil. He is challenged to depart from his victim. And like it or not, he departs. Since the exorcism prayers at baptism are so specifically aimed at our salvation, St. Symeon of Thessaloniki advises that they be said very clearly and not just once. 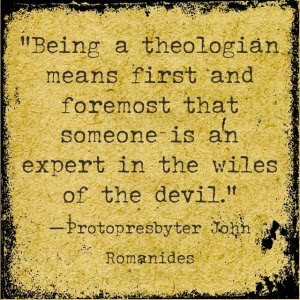 Otherwise the devil will find a way to trouble the Christian. In the early Christian Church, the reading of the exorcism prayers was a separate and impressive ritual. ● They were read many times: “Absorb yourselves in the exorcism prayers,” St. Cyril of Jerusalem urged those under instruction for baptism. ● The catechumens covered their eyes and faces, so as not to have their attention distracted (as happens today at the ordination of a deacon, who covers his head and face with a “towel”). Our Church uses the exorcism prayers of St. Basil the Great and St. John Chrysostom, which are read over all those who are suffering from possession and curses. ● They were not to be read unless there was a serious, specific reason. ● They were to be read silently (without those present being able to hear). ● Self-appointed exorcists, and those who read the prayers aloud in public, he berates. ● When the exorcism prayers are not read when and as they should be, then the devil assails the victim, the priest and those present. When the exorcism prayers are read over someone who is not yet baptized, Satan becomes infuriated. Something similar occurs when they are read over someone who is possessed. The devil, who is “bombarded” by the prayers, is challenged to depart from his victim. He is called upon to do something he detests. And he becomes very angry! The furious devil takes it out on his victim! He tortures him horribly. He contorts him and makes him writhe. 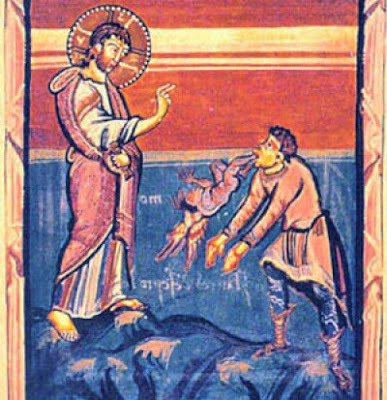 In December, 1996, a lady went to a church in the town of Patras in Greece and asked the priest (who later told the story) to read the exorcism prayers of St. Basil the Great. The priest was willing and did as she requested. As he made his way back home, stones began flying around him. He looked back but could see no one. Then, at midnight, something terrible happened. The whole house began to shake. The plates and the glasses in the kitchen sink were hurled against the wall and smashed. The cupboards in the house crashed to the floor. The priest quickly put on his stole, read the prayers which began “Holy God…” and the wickedness stopped. It’s quite clear. The demons were infuriated by the exorcism prayers and attacked the “culprit”. So, when you attend an exorcism without due attention, you could become possessed yourself! The experience of our Holy Fathers teaches that what draws demons out of people is humility. “Get out of God’s creature,” he said to the demon. “Your humility is driving me out!” wailed the possessed person, and he was then cured.